Newington Green 1987 by Magnus Irvin. Household?. Recent redevelopment of the local community centre destroys local murals! Early last year (2010) whilst rummaging around in Islington's archives, we came across a press cutting displaying an attractiveTrompe-l'oeil mural. The random page from a magazine had no note of where the mural was or who it was by. The only thing we knew was that it was located somewhere in Islington, London's smallest borough. Even with the borough being diminutive in size, it would still be looking for a needle in a haystack. However one fine day whilst on a mural photo adventure to boldly go where the London Mural Preservation Society had not been before, We found ourselves at the junction of Wolsey Road and Mildmay Road, much admiring a trompe-l'oeil mural displayed on the side of a house. As we were taking pictures, a lady stopped to chat; she approved of our recording of the murals and asked if we were going to take some photos of the ones in the estate. Well, we knew nothing about any others murals situated in the area so we thanked her, hurriedly packed away the camera and went to find the paintings. Wandering into the estate, it didn't take to long to spot paint on brick. Around one of the building entrances, there was a painting of a tree - there was a large quantity of ivy climbing the walls so much of this was covered. Then around the corner, down one side of the building is a surreal trompe-l'oeil with bushes, fountains and urns. This was the image in the press cutting - at last we had found the mystery mural! At the back of the building was a painting of a lion around the other entrance. It bared the scars of much ivy overgrowth. And still there were more murals to come. Around the side were giant flowers - much faded and hard to find a good view to photograph. The pieces were all well executed however it was a hodgepodge of paintings which seemed more about being decorative than creating a coherent whole. All things have to move one and develop. The community centre is just in the process of being reworked to make a more environmentally friendly building. Luckily we managed to witness these murals before they totally disappeared. 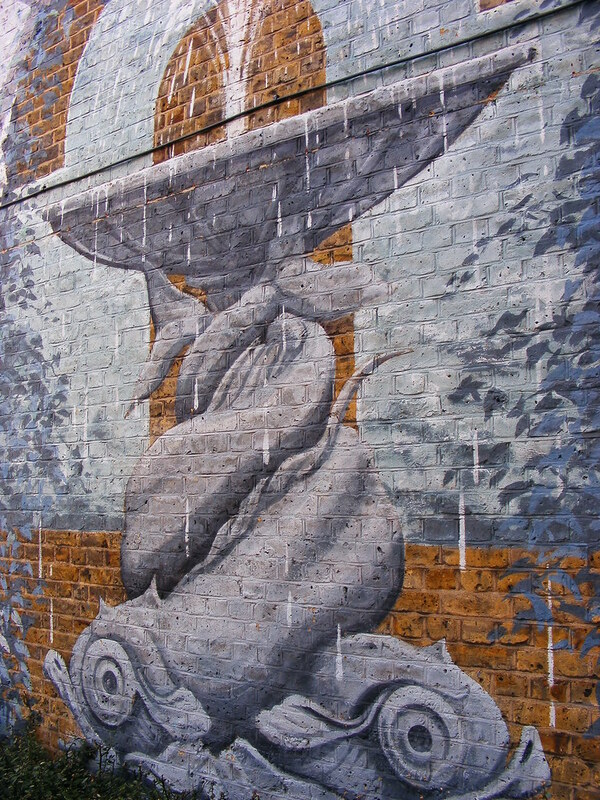 Recent investigation has discovered the name of the artist - Magnus Irvin - a seasoned muralist! Hopefully we should now be able to get a bit more background to the history of this piece. The mural no longer exists.